World number one Roger Federer outclassed James Blake 6-0 6-3 6-4 to win the Masters Cup in Shanghai. Federer took just an hour and 37 minutes to claim his third title at the prestigious year-ending event, and his 12th from 17 tournaments this season. 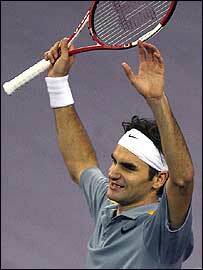 The Swiss master also won it in 2003 and 2004, when it was held in Houston. He suffered a surprise defeat to David Nalbandian in last year's final, but mercilessly took apart Blake, who could only convert one of 11 break points. Federer's unbeaten run through the tournament saw him add $1.52m (£800,000) to his year's earnings, becoming the first player to earn more than $8m (£4.2m) in a season. It was his 29th win in a row, and his 92nd of a year in which he has won three Grand Slams and been beaten just five times. The only players to beat the 25-year-old this year were Rafael Nadal, who won four finals against him, and Britain's Andy Murray, who beat him in Cincinnati in August. Federer said he could not have played any better. "I even had to laugh at one stage at how well I was playing," he said. "I always came up with a great answer. I was in control all the time and pretty much everything I wanted to do, I did. "At this stage in my career I'm so happy with my game, it's come such a long way." Blake reached the final on his debut appearance at the event after beating world number two Nadal and number three Nikolay Davydenko in the round-robin phase, and defending champion Nalbandian in the semis. But the American, who finishes the season ranked number four in the world, took 34 minutes to get on the scoreboard in the final, finally holding serve in the second game of the second set, after saving two break points. He managed to break Federer for the only time when the Swiss was serving for the match at 5-2 in the third. But it was only a temporary blip, Federer setting up triple match-point in his next service game with a trademark backhand down the line, before clinching victory with a powerful serve that Blake could not return. "There was nothing I could have done. He played too well," said Blake. "I've probably run out of adjectives to talk about his excellence. He's unbelievable and he steps it up in finals. Jonas Bjorkman and Max Mirnyi won their first Masters Cup doubles title with a 6-2 6-4 defeat of Mark Knowles and Daniel Nestor. It was a second title for Bjorkman, who won the then season-ending ATP Tour World Doubles Championship with Jan Apell in Jakarta in 1994.